There are few regions more striking – and undeniably more “alpine New Zealand” - than the South Island's West Coast. With landscapes that hark back to the Ice Age, it's a location where the snow-covered Southern Alps are at their most wild, the National Parks are incredible, and the glaciers are both accessible and awe-inspiring. It's truly winter majesty in the fullest sense, blending native forests with dense bushland and extensive mountain ranges which all boast a near-total lack of human influence. If you're looking for happening nightlife or an in-depth look at New Zealand culture, the West Coast is mostly not for you – nature is everything here, and the sheer array of National Parks (five in total, the most of any part of NZ), hikes and walks offer perspectives on colours and formations you won't find anywhere else in the country. The pristine blue of lakes and rivers fed directly by glaciers, with their glassy waters bordered by vibrant green forest and towering granite peaks are a mountain paradise exemplified, so if you're looking for the truest, most unfiltered look at the Great Outdoors, then be sure to add the West Coast to your NZ itinerary. When most attempt to conjure up images of the NZ West Coast, it's undoubtedly its two most famous massive glaciers that first spring to mind and that help differentiate it from the majority of other regions in the country. Upon seeing them firsthand, it's not hard to see why; the sheer scale of the white-blue ice floes alongside the vibrant rainforest greenery blanketing the surrounding mountainous terrain makes for one of the most photogenic spectacles in all of New Zealand. While the Fox and Franz Josef glaciers are just two of the more-than-140 that flow from the Southern Alps, they're the only two that penetrate as far as the lower rainforests, and as such are the closest to see level of any others. The Franz Josef is the higher of the two and is also steeper on average, with helicopter currently being the only way to access its ice. The Fox Glacier meanwhile is both longer and lower, and thus more accessible for most travellers as its lower section can be accessed via the river valley floor as well as by air, and therefore tends to be the more popular of the two as guided walks become an option here. If you're wanting to explore the glaciers, you'll thus have to make the choice between types of tours: a shorter (and therefore cheaper) trip into the lower glacial valley beside the riverbed, before heading onto the ice itself and being shown the various stunning ice crevasses and ridges along a safe route, or take the plunge with your wallet and embark on a heli-hike adventure that will take you further into the heart of the glacier for an even more amazing look at intense ice caves and arches. The sheer scale of the white-blue ice floes alongside the vibrant rainforest greenery blanketing the surrounding mountainous terrain makes for one of the most photogenic spectacles in all of New Zealand. During these walks you'll be fitted with purpose-built crampon shoes to prevent slippage and follow your guide to some of the best features that they've learned from experience. Heli-hike options with operator The Helicopter Line have the bonus of being able to view the glaciers from the air – which provides the benefits outlined in our Helicopter Flight section above – while also providing several hours of traipsing around on the ice and getting some detailed information on the structure of the glaciers as well as Maori legends and other historical background that helps put the region into context. Clamber through ice formations and caves, snap some photos from stunning outlooks through misty cloud cover, carve climbing steps in raw ice – just a few of the things you'll get to do while on the glaciers. With both glaciers only roughly 20 minutes' drive apart, it's highly possible to do both – the only limits being the weather, time and money. Tours are available from both Queenstown and Wanaka that provide the option of either coach or flying directly, with the former obviously more budget-conscious than the latter. As both of these natural wonders are continually retreating due to external influences and as two of the main natural highlights not just in the West Coast but all of New Zealand as a whole, it's highly recommended to do them as soon as possible while they're still undeniably beautiful. One of the most famous of New Zealand's series of 9 “Great Walks”, the Heaphy Track is an epic journey through the Kahurangi National Park and showcases all the terrain that gives the West Coast its famously-beautiful reputation. Guided tours are available with Southern Wilderness New Zealand who combine expert guidance with a culinary aspect that adds a hint of luxury to the walk itself. Spread out over the course of 82 kilometres which can typically be navigated over 4 to 6 days depending on pace, the track follows an ancient Maori trail across a wide array of terrain that spans everything from giant trees, sheer cliffs, bridges spanning broad rivers and, of course, majestic mountains. The spectacle shifts from one panorama to the next each day and it's this variety – as well as the relatively “moderate” difficulty – that make the Heaphy Track such a popular walk. It's the most gentle of the Great Walks, and thus can serve as a great introduction for gauging your endurance should you be planning to embark on any of the others throughout the country during your time in New Zealand. The track features plenty of huts maintained by the Department of Conservation that can be booked prior to departing and make for great stopovers, with their distances strategically placed to coincide with the average walking distance of a day's journey for most travellers. The walk can be done in both directions – from west to east or vice-versa – with the journey from the west (starting at Collingwood and ending in Karamea) the easier of the two options, allowing you to focus solely on the beauty of the surroundings rather than any perilous slopes. With the exception of one or two, the seven total huts along the track are famously well-maintained by DOC members, and provide cooking facilities and utensils such as pots and pans. If you're not feeling confident enough to do the track independently, guided walks are available that take care of both navigation and dining concerns, as your guide will typically have skill and knowledge with food preparation on the journey – although this option can prove costly. If you're looking to take your first steps (literally) into the world of the NZ Great Walks, the Heaphy Track is an ideal, and unforgettable, starting point. Often acclaimed as one of the world's best coastal drives, NZ's West Coast's Great Coast Road is a dramatic example of the West Coast's ruggedness set over a stretch drivable road from Westport to Greymouth and through Paparoa National Park that provides a stunning blend of geographical and wildlife sights along the way. With massive, steep limestone cliffs on one side and deserted, rugged beaches assaulted by crashing waves of the Tasman Sea on the other, it makes for a showcase of active scenery and and impressive views around every corner. To put things into context for Aussies, this is basically New Zealand's equivalent of our own Great Ocean Road – expect spectacular rock formations and various scenic lookouts to stop at along the way. Each of these stops offers something different – with three of the must-visit attractions on this list, the Cape Foulwind Seal Colony, Lake Brunner and Pancake Rocks at Punakaiki - mentioned above along with numerous other highlights that offer adventure and historic opportunities from gold mining fields to kayaking hot spots and national parks that contain a cavalcade of natural spectacles to take in. With massive, steep limestone cliffs on one side and deserted, rugged beaches assaulted by crashing waves of the Tasman Sea on the other, it makes for a showcase of active scenery and and impressive views around every corner. While the drive can be done non-stop in a matter of hours, if you're wanting to take the time to stop and explore all of The Great Coast Road's best offerings it's advisable to allocate three days worth of exploration, divided up into three sections. An itinerary that forms a nice compromise between distance and time is a trip spaced out over 3 days from Westport to Greymouth. Beginning from the north end at Westport, on the first day make the drive south and detour to the small settlement of Denniston to take in some of the rich mining history, then explore Karamea and take part in any number of activities such as hiking, fishing or caving before wrapping up the day with an overnight stay in Karamea itself. On day 2, depart from Karamea and you'll soon come to the Cape Foulwind Seal Colony (detailed above) followed by Punakaiki and the Pancake Rocks (also above), which make for two of the best stops in the region as well as a quaint place to stay. Wrap up the third day with a trip to Greymouth – the largest settlement in the region – stopping to explore the replica 1880's village of Shantytown along the way. More than “just a drive”, The Great Coast Road is a scenic gateway to many of the West Coast's best wonders, and thus a must-do when visiting the region – simply hire a car, then get out and explore. Part of the south-west corner of the wondrous Kahurangi National Park, the Oparara Basin features a range of special scenery that differs from the spectacular-yet-predictable snow-capped peaks of the Southern Alps, with formations of limestone and a spectacular cave network that do a lot to differentiate itself as a unique location in the region. Accessed via roughly a 45 minute drive from nearby Karamea, the Oparara's walk takes travellers through some of the best examples of untouched New Zealand bushland on offer that is filled with the song of birds as well as numerous individual limestone wonders along the way. Brimming with tall native beech and rimu forest and carpeted with ferns of all shapes and sizes, it's a display of dazzling greenery that remains completely un-commercialised. Guided walks are available that will take you through the bush to the valley's iconic Honeycomb Hill Caves – an expansive network of limestone that is not only visually stunning but also home to the country's largest collection of extinct New Zealand bird bones, including those of the massive Moa. Spread out over the course of roughly 15km worth of highly complex tunnels and passageways and boasting over 70 different entrance points, the cave network can only be accessed by guided tour and features a variety of weird and wonderful limestone formations and wildlife. Both stalactites and stalagmites jut from the ceiling and floor, while various outcroppings of cave coral can be found along the way – all of which are untouched by humanity and make for an eerily alien-like atmosphere. Various individual caves can be encountered along the way, each with their own shape and character – some are completely dark and require the use of helmet lights, while others have blades of sunlight piercing their ceilings and create dazzling effects as they shine down onto the walls and running water of the caves. Glow worms are also a highlight of the cave network, and can be found perched on the cave walls casting their glimmering light to penetrate the darkness. Lastly, one of the most popular non-cave walks in the area is the journey to the Oparara Arch – the largest natural rock arch in the Southern Hemisphere – which measures 43 metres high and 219 metres long and is an amazing example of a limestone tunnel spanning a flowing river beneath. The walk takes only 50 minutes return, and is conducted on a track through mossy rainforest that's in generally good condition and follows the course of the pristine Oparara River. An impressive example of greenery and rock amongst all the more famous snowy attractions of the West Coast, don't let the Oparara Basin fall under your radar if you're interested in caving or bushwalks. The Punakaiki area of the West Coast along the coastline is striking and ruggedly beautiful like much of the rest of the region, however what sets it apart in its own right are its Pancake Rocks and blowholes at Dolomite Point along a wonderful stretch of shore on The Great Coast Road (detailed further below) which makes for an essential stop on the way to Franz Joseph. Accessible via a well-maintained walkway that loops from the main road, the area is home to giant cliffs and boulders amongst a turbulent and roiling coastline that is highly active – particularly at high tide. The most prominent features are the Pancake Rocks, which are exactly what their name sounds like – large stacks of limestone on top of one another to give a “pancake” effect that have been formed gradually by the wind and water over the years to their current shape. This layered effect makes for a sight that's both unusual and impressive, and is not something that's seen very often in nature. Further along, the walk is made all the more dramatic by its blowholes of salt water from the Tasman Sea that surges up a narrow channel then spouts high into the air, spraying their voluminous contents dozens of metres above sea level. These sprays often create rainbows which make for incredible photo opportunities when contrasted with the rugged brown of the nearby rocks. The rhythmic nature of the landscape is both impressive and hypnotic, as the waves continually crash against the rocks, the jets spout, and the process repeats itself continually until the tide retreats. There are four main blowholes throughout the track, each of which provides a different aspect – the Sudden Sound Blowhole makes a cacophonous noise as the sea rushes through, while the Devil's Cauldron is a wide, circular offering, the Chimney Pot Blowhole features spray that shoots through the air like smoke due to its narrow channel, and the largest – the Putai – which creates the largest spray of all. Offering impressive coastal views out to the point to the north and as far as Mount Cook to the south on clear days throughout its course, the walk only takes around 20 minutes worth of pure walking, however since you'll likely want to pause at a number of points along the way to grab photos it's best to allow 45 minutes or so return. 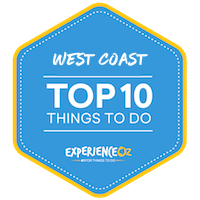 As an added bonus, it's one of the top natural attractions in the region that's also entirely FREE to access, so if you're a self-driver after a cost-effective way to take in the raw power of the ocean combined with some of the more unique local scenery you're likely to come across, they make for a solid choice. Alternatively for those wanting to kick back and enjoy the scenery along the way themselves, local operator New Zealand Discovery Adventures offer guided tours to the rocks and their surrounding national park from Greymouth, providing plenty of extra insight and background - as well as comfort - along the way. The unique and spectacular nature of the West Coast's scenery also comes at a price – a large amount of it is notoriously difficult to access, and some of its most spectacular spots can actually be quite hazardous to reach for the inexperienced hiker or climber. Enter local operator The Helicopter Line who offer airborne adventures to some of the most visually impressive spots on the West Coast that are ideal for those with limited time or who are wanting an unforgettable vantage point on everything from vast forests and national parks through to the vast white expanse of its famous glaciers. With a variety of scenic helicopter flight packages available, they aim to allow guests to see only the particular sights of the region they want during their trip, providing shorter and more reasonably-priced options in what can otherwise be quite an expensive activity. Both the Fox and Franz Josef glaciers (detailed further below) – as well as nearby Mt Cook – are on offer here, and each offers a window into the massive icefalls and expansive white floes which comprise these extraordinary alpine areas. The range of unique and unusual ice formations at the glaciers take on a whole new life when viewed from the air, and during the helicopter tours you'll also get the chance to perform an on-glacier landing for a chance to roam the vast snow fields for yourself. Taking a guided walk through the white expanses, you'll be able to take some stunning photos, make snow angels and even have a snowball fight while snow-dusted rocky peaks surround you on all sides – which is quite a humbling experience and can make you feel very small. Your pilot/guide will take you on a short walk/hike to inspect some of the naturally-formed ice caves and holes near the landing point, with the shapes of some of the ice formations being particularly striking up close. Scenic flight options typically range from between 20 to 40 minutes depending on if you're visiting one or both of the glaciers, and the open nature of the helicopter's windows means its quite possible to get great views both while in the air and after landing. Both the Fox (6km from the glacier, population of around 400) and Franz Josef (5km from the glacier, population of 330) townships serve as departure points for the flights themselves, and with the only other way to get up close with the glaciers being an arduous and length ice walk, glacier helicopter flights are well worth the investment – the pictures you come away with will likely be unlike any you'll encounter again. Keeping the watery theme alive, jet boating is a popular activity that is prevalent throughout New Zealand, however the journeys offered on the picturesque Haast River largely serve a different purpose to the standard adrenaline-based experience most jet boat operators provide their guests. The emphasis here is undoubtedly more scenic, as the scenery of the West Coast region when seen from the river is something that's made to be appreciated rather than simply zipped-by at high speeds. This great stretch of water – over 100km in length – carves its way through a deep and narrow mountain valley before opening into a wider area that is even more spectacular; high vertical sides are broken up intermittently by hanging valleys and stream fans and plenty of mountains covered in lush native bush. The wide array of scenery on offer is thus appreciated at a slightly more leisurely pace with Haast River Safari – don't expect the non-stop stunts of similar trips in Queenstown and other areas of NZ. In this case, guests join the operators and hop inside fully-enclosed river boats with huge viewing windows that aim to provide the best possible views of the impressive surroundings while still keeping passengers warm and dry in a region that can become exceptionally cold during the winter months. The emphasis here is undoubtedly more scenic [than other types of jet boating], as the scenery of the West Coast region when seen from the river is something that's made to be appreciated rather than simply zipped-by at high speeds. During the trip, you'll learn about the history and geography of this World Heritage-listed area as the boat cuts its way through bright blue glacial waters and the various greenery and mountain peaks pass by on both sides. The tour also includes a stop to disembark and explore the shoreline to get more of an up-close and intimate look of one of the few parts of New Zealand that still remains truly untouched. Those thus expecting a high-octane experience focused purely on providing a rush will likely want to stay away here, however if you're wanting to get a dose of the best NZ's back country has to offer, it's a must-do trip. Staffed by driver/guides who obviously love what they do and are able to share a ton of what they know both about the Haast area and New Zealand in general, this is a pleasurable tour experience that provides plenty of great photo opportunities of both natural features and wildlife – particularly birds - alike. One of the best scenic cruises in the West Coast region – and one of the most leisurely ways to take an array of its scenery in as opposed to many of the far more strenuous options detailed further down on this list – the Haast River Safari gives guests a great look at the heart of Te Whaipounamu (the South West World Heritage area). One of the best spots for fresh water fishing in NZ and a hub for water-based activities, Lake Brunner is just a short trip from the town of Greymouth and a key stop on the epic TranzAlpine Railway journey. Despite being the largest lake in the region, it's not particularly heavily visited which makes the lake a great spot if you're looking to get away from places that are busy with tourists. With the only real settlement in the area the tiny village of Moana, Lake Brunner provides a truly escapist vibe and is thus the perfect location for a post of peaceful fishing, boating or water skiing as well as getting off the water and enjoying a range of scenic walks and hikes. As far aquatic activities go, fishermen will be in their element here as Lake Brunner boasts one of the highest populations of Brown Trout on the South Island, with quality fishing available all-year-round. Fly, spinning and trolling are all viable here, and with the generally uncrowded nature of the Lake there's seldom too much competition for coming away with a quality catch. Fishing tours are available for those who want to be taken to the best spots for fishing, while first-timers can enroll in some lessons to learn the art all amongst some picturesque surrounds (local fisherman Brent Beadle comes recommended for both these purposes). Scenic boat trips of the lake are also an option for those wanting to take in the various mountains and other surrounding greenery, while the Arnold River that flows from the lake is a popular spot for more adventurous activities such as kayaking, white water rafting and jet boating. In terms of exploring the land around the lake, there are a range of quality walking tracks of varying lengths that are a pleasure to traipse around, ranging anywhere from 45 minutes to 7 hours for a return trip. Most of these start from nearby to the township of Moana and head in a variety of different directions; perhaps the most popular of these is the Kotuku Whakaoho walking track which starts at a boat-launch point across from Lake Brunner Lodge, following a boardwalk through a range of lush wetlands through dense forests of tall trees rimmed with tree ferns while offering great views back out to the lake. The track stretches for just over 7km and takes around 2.5 hours return and makes for relatively easy going, so you won't need to be of an exceptionally high fitness level to enjoy the awaiting scenery. If you're looking to enjoy a laid-back atmosphere mostly free of fellow tourists – or are a fishing enthusiast who's visiting the region – then Lake Brunner makes for a great spot for a day trip or an overnight stay while in on the West Coast. Seeing wildlife in a zoo or other similar facility is all well and good, but there's simply something a little more magical about seeing animals out in the open in their native habitats, and this is perhaps best exemplified on the West Coast by the Tauranga Bay Seal Colony at Cape Foulwind, which overlooks the often wild waters of the Tasman Sea. Featuring one of the busiest-year round seal colonies in the country – which reaches its peak during the period between October to March when the large male Bull Seals return for mating – the area is also incredibly scenic nature-wise in and of itself; the walkway at Cape Foulwind takes you on a journey around this ruggedly impressive stretch of West Coast coastline to take in a spectacle that includes amazing views from clifftops, numerous ocean rock formations and waves crashing against rocky shores capped off with a charming lighthouse at the end. It's a dramatic panorama, to be sure, but the main attraction is no doubt the seals themselves, which can be viewed from a specialised viewing platform that overlooks the main section over the cove in which they congregate. The entire attraction is comprised of a range of inflatable adventure platforms, swings, rides and activities of varying difficulties with the chance to glide, climb, battle, slide and jump depending on your choice. Positioned just above the colony, from the platform you'll be able to see the likes of baby seals with their mothers, large males lazing on the shore, and some heading in and out of the water to catch some feed. The viewing platform also provides curated plaques detailing information and various facts on the seals – including their breeding cycle, yearly colony activity and other interesting tidbits. Cape Foulwind sits at the tip of Buller Bay just a short 15 minute journey from the West Coast town of Westport, and the walk to the seals is both easy and relatively short – it only takes 10 minutes or so from the carpark, making it accessible and enjoyable for all ages (and, perhaps just as importantly, entirely free). There's also a cafe further along the bay that's easily reachable should you wish to take a break for some refreshment or bite to eat as well. As a favourite amongst adults and kids alike, it's well worth making the trip to the Cape – not just to see the seals, but to continue on for the coastal walk and perhaps enjoy a picnic at one of the great vantage points overlooking this impressive coast as well. That most “New Zealand” of wildlife icons – the Kiwi bird – and many of its ilk can be found at the quaint-yet-informative West Coast Wildlife Centre that is home to some of the rarest and most endangered of endemic bird species in NZ today. Of all of the five different species of Kiwi currently in existence, the West Coast Wildlife Centre is home to the rarest – the Rowi and Haast Tokoeka – which have become endangered due to a combination of both predators and human-influenced habitat destruction. Designed as both an attraction and an effort of conservation, the centre serves as the site of New Zealand's incubation and captive rearing program for both of these species, it also serves as a great option for a wet-weather attraction in the region should the skies turn sour – which can happen frequently in this area. As Kiwis are nocturnal animals, the West Coast Wildlife Centre offers a viewing area that is kept quiet and dark, which is conducive to coaxing the maximum amount of activity out of the reclusive flightless birds. Designed as both an attraction and an effort of conservation, the centre serves as the site of New Zealand's incubation and captive rearing program for both of these species, it also serves as a great option for a wet-weather attraction in the region. As a (worthwhile) optional extra, there's also a “backstage” tour that will take you behind the scenes for a more detailed guided look at both the Kiwis themselves as well as the centre's breeding and release program. This experience allows visitors to see recently-hatched baby kiwis up close while learning about the various species and the appropriate conservation efforts catered towards each type. The experience is capped off by a section dedicated to explaining the glaciers of the area and going into detail about their formation and deterioration over the years, which provides further insight for first-time visitors to the greater region as a whole, as well as a cafe where a drink and an informative video can be enjoyed. While it's largely a singularly-focused facility to showcase and support the Kiwis (don't expect a full-blown wildlife park), the entry fee goes towards the preservation of a national icon and is thus more than justifies the cost. Simply put, if you're wanting to see Kiwis in action, this is the spot to do so.